The museum features 20,000+ items from the life's work of longtime Superman enthusiast and collector, Jim Hambrick who has amassed one of the greatest collections of Superman memorabilia in the world. Among the items showcased in the museum from the iconic superhero's 75+ year history are virtually every Superman toy ever produced as well as movie props and promotional materials from all the Superman movies & TV series (including "Smallville" and "Man of Steel") and one of the only George Reeves Superman costumes still in existence. The musum is organized around particular eras and portrayals of Superman, spanning television, movies, and comics; and is changed frequently, to encourage repeat visits. If you ever have the oportunity to travel to Metropolis, Illinois, we invite you to stop by the Super Museum for some SUPERFUN FOR THE ENTIRE FAMILY!!! Jim Hambrick runs the Superman Museum on the town square in Metropolis, Ill. A longtime Superman enthusiast and collector, Jim has one of the greatest Superman collections in the world. Among the items are virtually every Superman toy ever produced, props from the Christopher Reeve movies and one of the only George Reeves Superman costumes still in existence. 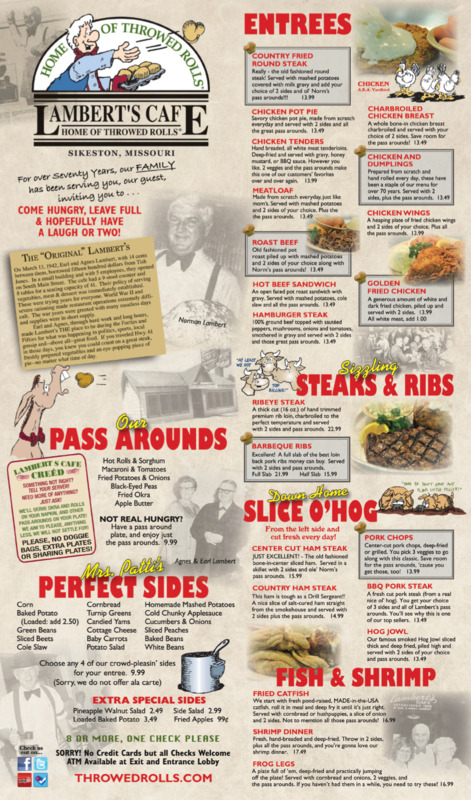 People who visit Lambert's Cafe for the first time are invariably amazed at the generous portions served on each order. These generous servings along with our "THROWED ROLLS" have inspired many questions. We cannot describe our activity in great detail, but we've endeavored to point out some of the highlights of our "Throwed Rolls" cafe. No Credit Cards, but Checks are welcome! 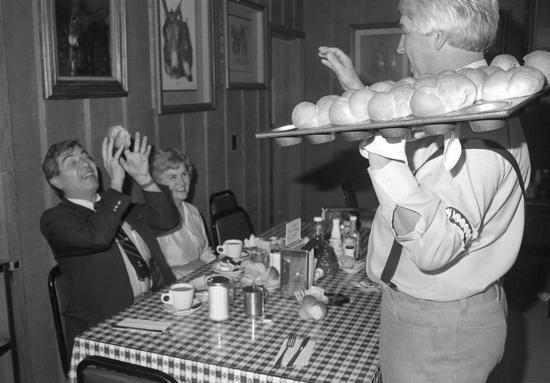 When somebody asks Norman Lambert to please pass the bread, he takes them literally. Lambert throws it at them. 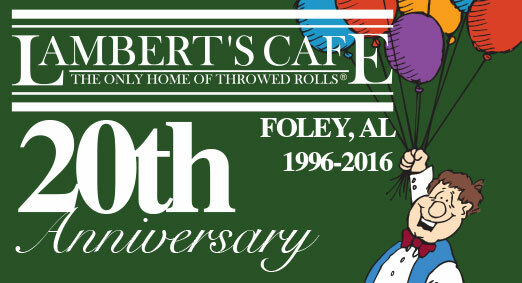 In fact, Lambert estimates he probably throws 200 dozen homemade rolls a day during the week and 300 dozen a day on weekends. 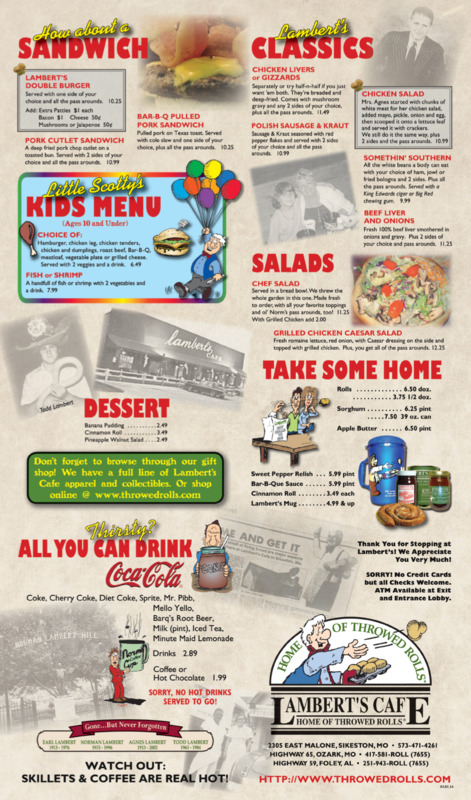 The roll throwing and other antics--as well as the food--are the drawing powers of Lambert's Cafe, located on Old Highway 61 in Sikeston and managed by Lambert. On Lambert's homemade "Throwed" rolls last year, we used 23,760 - 44 oz. cans of sorghum molasses. 15,900 gallons of milk are used annually as a drink and for cooking and baking. We've been told that it takes approximately 17 cows, working night and day, to supply the milk we use at Lambert's. Last year our cooks, bless their hearts, cracked and cooked 368,940 eggs. Last year we cooked 132,743 lbs. of choice round beef. It took a herd of 265 USDA choice steers to serve our customers! 180,000 lbs. of chicken breasts and legs were cooked in our two chicken fryers. We also cooked 73,980 lbs. of chicken livers. (The OTHER parts went somewhere else!) Lambert's cooked a grand total of 253,980 lbs. of chicken last year. Every week we bake over 2,400 of the biggest, tastiest cinnamon rolls that ever passed your lips. Sooooo big we call them "Hubcaps". We use approximately 302 gallons of slaw a week or 15,728 gallons a year and 2,509 gallons of mayonnaise. Think of the number of man hours required to shred the cabbage used in our slaw. We served fish every day and cooked 48,409 lbs. of fresh Mississippi pond raised catfish. That's no fish story! What started as a lark turned into a gigantic job. We used to pass okra on occasion but the patron's of LAMBERT'S CAFE decreed that it should be passed every day, at every meal. Last year alone we cooked and fried 73,440 lbs. of Arkansas okra which was distributed to our customers. We hand washed, wrapped and baked over 68,000 potatoes. Along with 33 tons of French fries. Also we used over 130,480 pounds of onions in ole Norm's fried potatoes. That'll bring a tear to anyone's eye! Pork chops have been a great addition to this past years menu. In this time we served 71,900 pork chops. That ain't good news for the hog!! Once we just served jowl for breakfast but lately we've been offering it on our dinner menu too. What a response hog jowl received. We now serve over 399 pounds per week or 20,785 pounds a year. It's sugar cured and aged to perfection and to just be honest - bacon just "don't" compare. Try it on your next visit. 48,960 lbs. of white beans were served to our customers last year. More than half the people of the world depend on wheat as one of their basic foods and more of the earth's surface is covered by wheat than by any other food crop. Of course, the most popular wheat food is bread, which brings us to Hot Rolls. Our ovens turn out rolls from 9:15 a.m. to 9:00 p.m. usually without stopping. With this in mind we thought you might be interested in the following: last year we averaged baking 520 dozen rolls per day, for a grand total of 2,246,400 individual rolls. Our rolls are 5 inches in diameter and if we laid all the rolls that we baked in one year side by side, we would have 177.27 miles of rolls. In the past 21 months we have baked enough rolls to reach 300 miles. 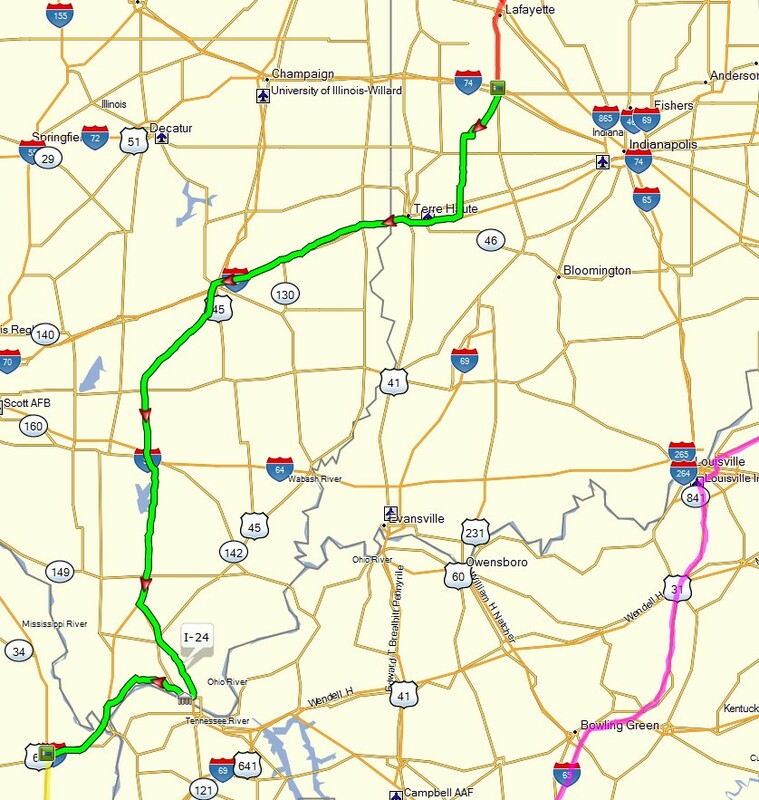 That's the distance between St. Louis, Missouri and Memphis, Tennessee.